The asymmetry between personal states and the impersonal forces that now confront them can be witnessed in the case of Israel. The British protectorate of Palestine, carved out of the defunct Ottoman Empire, was opened to large-scale Jewish immigration by the Balfour Declaration of 1917. Later, in the wake of the Holocaust, the desire of Jews for a state of their own became irresistible, and the retreat of the British from their protectorate was hastened by the terrorist methods of the Stern Gang. Israel quickly transformed itself thereafter into a nation-state by allying a historical national identity with an existing territorial jurisdiction. The Jews' pre-existing attachment to the Promised Land endowed the rule of law that the British had begun to establish in Palestine with the much-needed territorial loyalty. The result is that the state of Israel exhibits personal sovereignty on the Western model, and a genuinely democratic system of government. Few people doubt the injustice done to the Palestinian Arabs, both Muslim and Christian, in this process. But the fact remains that, for better or worse, Israel now exists in the heart of the Middle East, a personal nation-state surrounded, since the virtual annexation of Lebanon by Syria, by tyrannies, factional groupings, and terrorist movements that have only a fictitious personality either in fact or in law. … the argument for a Palestinian state is surely overwhelming. However it is doubtful that a Palestinian state, if founded, would easily develop the kind of corporate personality that I have attributed to the United States. For this would require, if my argument is right, the emergence of territorial loyalties that transcend the bonds of religion and asabiya and express themselves through some participatory form of citizenship. It would require, in other words, the same kind of radical break with local history that we see in Israel. Israel, meanwhile, suffers all the agonies of a personal state at war. It takes collective responsibility for its aggressive gestures, and its politicians rise and fall in response to the constant internal dialogue over principles and policies. Its leaders are subjected to criticism both at home and abroad, and, in its efforts to maintain the freedoms and rights that are the hallmark of personal government, Israel exposes itself to a constant stream of atrocities. The world supposes that Israel is at war with the Palestinians: but the Palestinians do not exist as a genuine agent in this war, and besides it is only in Israel that any Palestinian Arab can cast his vote in an election and expect to have some influence on what is done. To say this is not to approve of Israel's current policy towards the West Bank. Nor is it a reason to deny the plight of the Palestinians. It is simply to indicate the structural difficulty of the problem, and the near impossibility of making peace when there is no accountable agent with whom to negotiate. 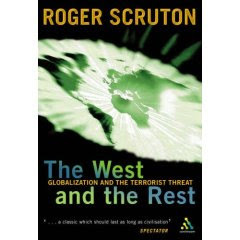 In The West and the Rest: Globalization and the Terrorist Threat, by Roger Scruton (Continuum Compact), pp. 139-142. Roger Scruton is a philosopher who was formerly a professor at Birkbeck College in London and at Boston University. He is now a freelance writer whose articles on political, cultural, and rural themes appear frequently in the British and American media.